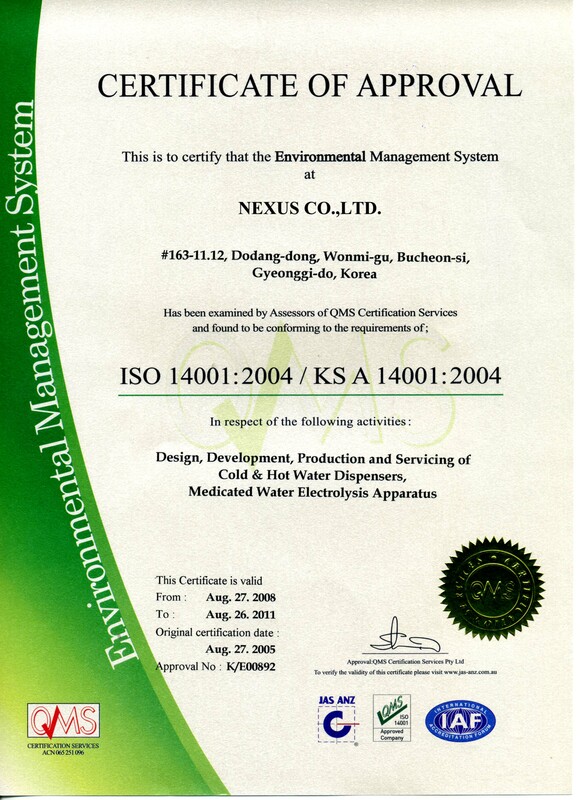 Nexus Water ionizers are a product of both Japan and Korea. One hundred percent of Nexus's main (ionizing) parts are imported from Japan. The Nexus machines have been developed in cooperation with Dr. Sano Yoshimi, CEO of Sano Technical Research Center of Japan. Dr. Yoshimi has had a major impact on the development, research applications and clinical trials of water ionizers, and is world-renouned in this field. Nexus makes their water ionizers of the highest quality materials and workmanship. 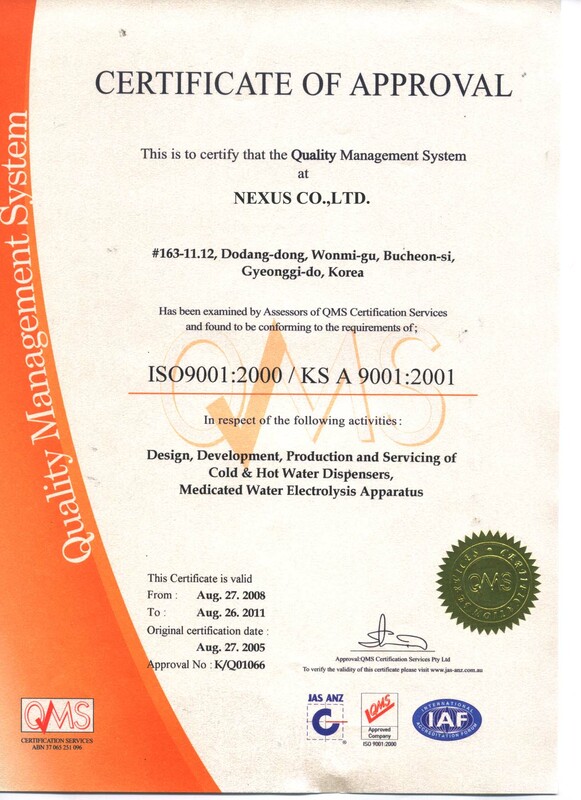 The Korean factory, which makes the Nexus water ionizer, is the same factory where LG and Samsung products are manufactured. So, I trust them and they use the highest quality of materials and workmanship. The Smart Water Ionizers are some of the best machines I have found, for producing hydrogen-water (H2-rich water). These ionizers get very high levels of molecular hydrogen antioxidants! We have been studying and testing water ionizers for over ten years, and we feel the Nexus water ionizers are of the very best ones to offer our customers. For more detailed information about Nexus water ionizers, see below our list of products on this page. Nexus water ionizers are very efficient, hospital-grade, water ionizers! Hospitals, researchers, and doctors who have worked with the Nexus Company over the past 20 or so years, have been very supportive of the Nexus brand. Nexus water ionizers are made in the same factory in Korea that makes LG, Samsung and other big name brands of electronics...so I trust the manufacturer. Nexus uses a patented method of spraying their plates to ensure the plate is thoroughly coated with platinum and that no dust or air-bubble gets trapped into the coating. This coating process is crucial to getting good performance and durability in a water ionizer, and this process is used in both the X-Blue and Smart Nexus water ionizer models. The plates have been tested and proven to increase the surface area of platinum and therefore produce very efficient ionization & maximum ORP. See this plate comparison. Hospitals, researchers, and doctors have benefited by collaborating with the Nexus Company over the past decades. Nexus engineers are leaders in the industry and help to bring the healing benefits of NEXUS BRAND alkaline ionized water to new levels of professional use, testing and validation. Nexus Water Ionizers: Superior Brand of Water Ionizers! Nexus water ionizers are a superior brand of water ionizers! The Nexus brand water ionizer engineers utilize the best practices in both design and construction-quality, and therefore they produce top-performing water ionizers. The video, below, demonstrates the power and capability of the new Nexus Smart 7P. These are awesome alkaline water machines, and because of our importing rights, we price them relatively low for the high quality you are getting. We pass the savings onto you when you buy Nexus water ionizers from Alkaline Water Plus. Nexus water ionizers have passed precise inspection by the manufacturer, under strict quality control, and come with a Nexus Lifetime Warranty as described herein. It is not expected that you will ever need repairs, but in the event you do you should save your invoice for proof of your entitlement to repair or upgrade under this warranty. For the first 5 years any defect which develops from spontaneous malfunction, is entitled to be repaired free of charge for both parts and labor. Note: Do not return your water ionizer for repair without pre-approval or without following our instructions for shipping. See the "After the First 5 Years" section, below, for further warranty benefits. If it is within 5 years of purchase date, and parts are no longer available or your machine is not able to be repaired, you will be credited up to 50% of the original price you paid towards the retail price of a replacement machine of your choice. Exclusions to Above Lifetime Warranty: This warranty is intended to cover spontaneous defects in the product only, but even if damage is caused by customer error, misuse, drops, rough shipping, improper care, infestation, collisions, fire, flooding or natural disaster, there are provisions in the warranty for this (see "upgrade-credits", below). We will repair your water ionizer at a reasonable rate no matter what the cause of the damage, even if caused by accident on your part, as long as the damage is repairable. If it is "totaled" cost of repair greater than cost of new machine, we offer upgrade credits (see below). Note: Any time you'd rather exchange your machine for a new one (any brand we sell) we can arrange that for you (see section on Upgrade Credits, below). If you have excess sodium, due to a water “softener”, or iron in your source water, you would need to filter them out as part of the expected proper care. Do not put salt in the mineral port of any Nexus water ionizer. Sodium and iron are both highly electrically conductive and could cause undue damage to your water ionizer over time. Change the filter at least yearly. If you don't do this, it could clog the machine and cause a leak to start. If "not changing the filter" is suspected, we will check your records or ask you for receipts to ensure you have purchased yearly filters. Not changing filters properly or keeping the machine clean fall under the heading of "customer-error" in the warranty. Nexus water ionizers will give you a continuous flow of high-quality ionized or filtered water all day long, however they are not intended for commercial use (i.e., more than a gallon of pouring at any one time or more than 15 gallons per day). If you live in a hard water area, please note that cleaning scale from inside a water ionizer is not offered as a free service, however we will send you instructions of how to do this easily yourself. If you know your water is hard, we suggest you use the EOS (Elimination of Scaling) Device to protect your machine. Undersink installation or any installation that keeps a Nexus water ionizer under constant pressure, is not authorized by Nexus, as it can cause too much pressure to develop in the water cell. Proper care of the water ionizer is necessary and is your responsibility as the consumer. If a malfunction occurs, further operation without making the needed repairs could cause more damage. For instance operating the machine with an internal leak could cause electrical shorts, rusting of internal screws and other such damage. While the first damage may be covered by your warranty, the further damage incurred by continuing to use the machine wouldn't. In these instances we will repair it up to the point where we can't get to a part due to internal rust of bolts. If that occurs we will offer you upgrade credit for a new machine. A lot of hassle can be avoided by promptly repairing the machine. Nexus water ionizers aren't intended to be left unused for several months at a time. The best use of a Nexus water ionizer machine is to use it every day. If you are away for more than a couple of weeks, the filter should be removed and placed in the refrigerator for when you return. If you aren't going to use it for several months, you should try to arrange for some water to be poured through it every month to keep the water cell from drying out. If the machine is disconnected from a water supply the provided plugs must be kept in placed on every port and a blank filter should be placed in the filter port. This will ensure the membranes in the water cell don't dry out. Operating the machine with a dried-out water-cell can cause the water cell to burst when you start it up again. If you think your Nexus water ionizer has dried out, contact us for detailed instructions on how to safely get it up and running again. Cost of shipping, both ways, is the responsibility of the customer for repairs and for upgrade-credit exchanges. Shipping Costs: You will be shipped a water ionizer that is in good working condition. If not, we will replace it without charging you shipping costs. After that, all shipping [both ways] for warranty fulfillment is the responsibility of the purchaser. Notes: We reserve the option to repair or replace unit [with same or comparable unit]. Transfer of Ownership: You may transfer ownership, but you will need to contact Alkaline Water Plus in order to do so. This warranty is backed by both the manufacturer of Nexus water ionizers and by Alkaline Water Plus, and we need to make sure all of our paperwork is in order prior to any warranty transfers. Repairs at Cost: After the 5-year basic period, we will perform needed repairs and only charge you our costs. There is a minimum cost of $100.00 to diagnose and make repairs. If the repairs charges exceed this, we will always get your approval of the additional amount before your card is charged the extra. Or, you may at any time opt for the Upgrade Credit instead of any diagnostic or repair fees being charged at all.